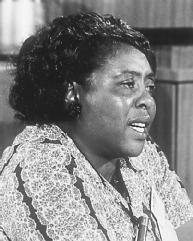 Fannie Lou Hamer worked for voter registration for African Americans in the U.S. South and helped establish the Mississippi Freedom Democratic Party (MFDP), which successfully challenged the all-white Democratic party in Mississippi. Hamer was born October 6, 1917, in Montgomery County, Mississippi. She was the twentieth and youngest child of Jim Townsend and Lou Ella Townsend, who were sharecroppers in rural Mississippi. Hamer grew up in a tar paper shack and slept on a cotton sack stuffed with dry grass. She first went into the cotton fields to work when she was six years old, picking thirty pounds of cotton a week. By the time she was thirteen years old, Hamer was picking two hundred to three hundred pounds of cotton each week. Because of her family's poverty, she was forced to end her formal education after the sixth grade. In 1944, when she was twenty-seven, Hamer married Perry ("Pap") Hamer, a sharecropper on a nearby plantation owned by the Marlowe family, near Ruleville, Mississippi. Hamer spent the next eighteen years working in the fields chopping cotton. Her husband also ran a small saloon, and they made liquor to sell. "If this is a Great Society, I'd hate to see a bad one." In August 1962, Hamer attended a meeting sponsored by the Southern Christian Leadership Conference (SCLC) and the student nonviolent coordinating committee (SNCC, pronounced Snick). The SCLC was founded in 1957 by a group of black ministers led by martin luther king, jr., and coordinated the Civil Rights activities of ministers. SNCC was organized in 1960 by students and other young people, and SNCC workers had recently come to Ruleville to organize voter registration drives. At that time, only five percent of African Americans in Mississippi who were old enough to vote had been allowed to register. Ten days later, a group of white men rode through the town and fired sixteen shots into the homes of those involved in the black voting drive. That night Hamer fled to her niece's house forty miles away. A few weeks later, SNCC workers brought her to the SNCC annual conference in Nashville. She later returned to the Marlowe plantation, where she found that her husband had been fired from his job and her family had lost its car, furniture, and house. Hamer then became a field secretary for SNCC in Ruleville, earning $10 a week, and began organizing a poverty program. She worked with the local people, educating them about their right to vote, and she became an effective fund-raiser for SNCC, traveling to northern towns to speak about life as an African American in Mississippi, and participating in civil rights demonstrations across the country. Hamer and her associates were often harassed, intimidated, and even beaten. Hamer helped found the Council of Federated Organizations, which brought large numbers of white northerners into Mississippi in the summer of 1964, known as Freedom Summer. These volunteers helped with voter registration and other civil rights activities, and their work focused national attention on the Segregation still rampant in the South. In April 1964, Hamer helped found the Mississippi Freedom Democratic party. The MFDP was organized as an alternative to the all-white Mississippi Democratic party, which barred African Americans from its activities. The MFDP planned to challenge the regular Democratic party's right to represent Mississippi at the Democratic National Convention in Atlantic City, New Jersey, in August 1964 and hoped to win the right to be seated as the state's legal delegation. Before leaving for Atlantic City, the MFDP held its own convention and elected sixty-four African Americans and four whites as delegates to the national convention. Hamer was elected vice chairwoman. Democratic president lyndon b. johnson, who was running for reelection in 1964, became worried that the MFDP would disrupt party unity and cause him to lose the election to Republican senator barry m. goldwater. Johnson went to work to stop the MFDP by having his supporters threaten and harass MFDP supporters on the Credentials Committee, which was scheduled to hear the MFDP's case at the convention. In nationally televised proceedings before the committee, Hamer testified about the difficult life of African Americans in Mississippi and how they were prevented from participating in the political process. She also described a brutal beating she received while in jail for violating segregation laws. The beating left Hamer nearly blind in one eye. Following Hamer's testimony, viewers from across the United States telegrammed their delegates, urging them to support the MFDP. Realizing he would now have to deal with the new party, Johnson worked out a settlement that called for the seating of two at-large delegates from the MFDP and a pledge that segregated delegations would not be seated at the 1968 convention. Hamer spoke out strongly against the compromise, and the delegation voted to reject it. Following the 1964 convention, Hamer continued her work in the Civil Rights Movement. In March 1965, she joined King and hundreds of others in a fifty-four-mile march from Selma, Alabama, to Montgomery, Alabama. She also traveled with a SNCC delegation to Africa. Back in Ruleville, Hamer and two other women ran for Congress against white congressmen in a special counterelection organized by SNCC. In the Democratic primary, their names were not on the ballot because the Mississippi election commission said they did not have enough signatures of registered voters on their petitions, and the white candidates won. In the SNCC election, however, the women's names were listed on the ballot, and they won. The women pressed their claim to be seated in Congress in Washington, D.C. They argued that Mississippi county registrars had refused to certify the signatures of black voters on their petitions. In September 1965, after nine months of investigation into their claim that the state had illegally obstructed their attempts to place their names on the ballot, the U.S. House of Representatives rejected their challenge by a margin of eighty-five votes. In August 1968, Hamer again traveled to the Democratic National Convention in Chicago as a member of the alternative Mississippi delegation, renamed the Mississippi Loyalist Democratic party (MLDP). Again, the party went before the Credentials Committee seeking recognition, and again, a compromise was offered, this time to seat twenty-one members of each delegation. The MLDP refused to compromise, and this time, the regular delegation was unseated. When Hamer finally took her seat at the convention, she received a standing ovation. Hamer went on to serve on the Democratic National Committee from 1968 until 1971. She also continued her civil rights work in Mississippi. In May 1970, Hamer and officials of the National Association for the Advancement of Colored People (NAACP) in Indianola filed a Class Action lawsuit in federal district court, claiming that the Sunflower County, Mississippi, school districts maintained a dual school system for black and white students and that black teachers and principals were not adequately protected against losing their jobs. The suit asked the court to order that one integrated school system be established and maintained. In Hamer v. Sunflower County (N.D. Miss., June 15, 1970), the district court, relying heavily on data in a report from a biracial committee headed by Hamer, ordered the county to merge its schools into one public school system. The U.S. Court of Appeals for the Fifth Circuit affirmed the district court in United States v. Sunflower County School District, 430 F.2d 839 (5th Cir. 1970). Hamer continued to work for the poor in Ruleville, organizing poverty programs, raising money for low-income housing, and starting a day care center. Her favorite project was the Freedom Farm Cooperative. She started the farm with 40 acres, which eventually increased to 650 acres on which five thousand people grew their own food. In 1976, Hamer was honored in Ruleville on Fannie Lou Hamer Day. She died March 14, 1977, in Mound Bayou, Mississippi, from heart disease, cancer, and diabetes. Engraved on the headstone of her grave in Ruleville are the words "I am Sick and Tired of Being Sick and Tired." Colman, Penny. 1993. Fannie Lou Hamer and the Fight for the Vote. Conn.: Millbrook Press. Lee, Chana Kai. 1999. For Freedom's Sake: The Life of Fannie Lou Hamer. Urbana: Univ. of Illinois Press. Mills, Kay. 1993. This Little Light of Mine. New York: Penguin Press. Rubel, David. 1990. Fannie Lou Hamer: From Sharecropping to Politics. N.J.: Silver Burdett Press.